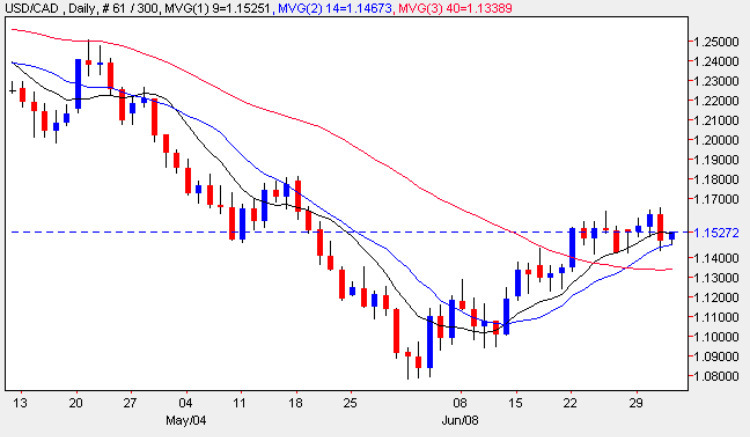 Despite the fact Canada was enjoying a national holiday yesterday, the usd to cad pair managed to provide some lively price action on the daily chart closing the day on a relatively wide spread down bar with the low of the day finding some support at the 14 day moving average. Technically the current price level between 1.15 and 1.16 is now proving to be a defining area for the current price rally from the low of 1.08. The currency pair seem to be finding the resistance in place at this level too much to overcome and given yesterday’s bearish engulfing candle (and dramatic fall in the price of crude oil) we may well see a reversal lower in due course. This view is counterbalanced by the fact that the 14 day average seems to be providing a barrier at present and only a break and hold below all three moving averages will confirm this picture. As with many other currency pairs the direction for today (and in the medium term) will be dictated by the outcome of the combination of the NFP release and ECB interest rate decision and statement.